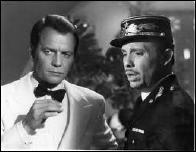 » A TV Review by Michael Shonk: CASABLANCA (1983). I watched these episodes a few months ago, mainly out of curiousity because I was puzzled that they had the nerve to try and do a TV remake. It was ok but nothing special and nowhere near the level of the 1942 film. But reading this review reminded me of one of the more insane and crazy conversations that I’ve ever been involved in. I love the game of baseball and have attended many hundreds of major and minor league baseball games. While watching a game at Lakewood, NJ between two minor league teams at the single A level, a guy came over, sat next to me and started to talk to me about CASABLANCA. Much to my amazement, he proceeded to attack the film as perhaps one of the very worse films he had ever seen. He called it boring and just a bunch of people standing around talking. He also said something about not liking black and white movies. There was more but I had to tune him out and I didn’t say anything until finally he took the hint and left. I guess the shock of such ignorance and stupidity just stunned me into silence. If I had to pick my favorite film, CASABLANCA would be in the running. I usually go to the games with a bunch of fellow baseball fans, who for the most part don’t watch the game and instead waste the time and beauty of a summer day blabbing about nothing. I’m just about the only one who concentrates on the action and suspense of the game. This time it saved me the embarassment of cussing the idiot or throwing my beer in his face. I did not watch any of this series when it was on. I was semi-tempted to, but I think like too many other possible viewers, I was put off of the sheer effrontery of anyone trying to cash in on the fame of the movie. I know I wasn’t watching any of the shows that were on opposite it. Thanks to you, Michael, for listing them. I simply must not have been watching TV on Sunday and Saturday nights back in 1983. What’s also surprising is that this series is available on commercial DVD. It’s available from Amazon, for example, and they have a nice feature there that reminded me that I’ve already bought the set, back when it was first released. It must have arrived, I shelved it away, and promptly forgot about it. I’ll have to look to see if I can find it. I’m really tempted now! #1. 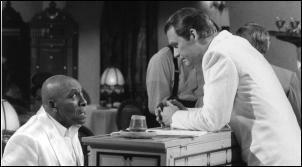 Walker, what makes CASABLANCA such as great movie is all elements came together to tell a near perfect story. One of the things that bothers me about directors such as Hitchcock is their use of the camera can call more attention to the picture angle than the story it should be telling. Michael Curitz work never put him before the story, yet the final shot is a visual icon of cinema. The acting, despite the stars, never overwhelmed the characters. Few actors could do as Bogart and make us like the self-pitying jerk that is Rick Blaine through most of the movie. The writing gave us some of the most remembered dialog of any movie. The music, setting, look of the film all come together to tell the story. But it is the story that makes CASABLANCA great. No movie has ever captured a moment in time better. It was 1942. The audience always enjoys the well done tragic love story, but there is more here. Watching Rick and Ilsa sacrifice true love for the good of the world was something that meant something to the audience of 1942 that we today will never totally understand. Suddenly, gas rationing, food stamps, etc the audience was dealing with at home wasn’t as hard. You can copy the plot, the characters, the music, the title, but you can never recapture 1942. But as long as Warners owns the title they will continue to try and find ways to make more money from it. #2. Steve, I have long given up trying to figure out why some titles make it to DVD when others don’t. But I suspect WB thought people would buy it for its title. I am not sure why, TV audiences rejected it when it was on free TV. But the fact this got a fancy DVD while HARRY O gets a overpriced cheap MOD of only one season tells us life is not fair. Michael, was this series shot in black and white, or are we just looking at black and white stills? #5. David, the series was in color. The Senensky website is as informative as it is impossible to navigate. The links I used were to his website but seem to have been forgotten by the home page table of contents. Oops, forgot to mention Ray Liotta. He played Sacha, the bartender. His version of the character was a young man from New York. He was basically a background character with little to do. The change in character’s nationality (wasn’t Sacha Russian in the film?) was a mistake. Rick’s Place should be multi-national to illustrate Rick’s distance from America in miles and soul. Having three of the four main workers at the saloon (Carl was the exception) was too many. David’s comment in #5 about the picture being in black and white suddenly reminded me that during that time nearly all publicity stills the networks supplied the newspapers were in black and white. This was because the use of color in the newspaper was so expensive and difficult it was done only in the Sunday paper if then. Looking back to my days at the Baton Rouge “Enterprise” (long gone) all the stills I received were black and white. Oddly, about all I remember from seeing this series in the 1980’s was how good Ray Liotta was. He was little known at the time. The series was an attempt to put some glamour on TV. It wasn’t great. But it was part of an effort to make some historical programs: Private Eye, Bring Em Back Alive, Tales of the Gold Monkey, Tales from the Hollywood Hills on PBS, etc. Much of this was pleasant, if mild, escapism, with an emphasis on glamour and heroics. #9. Mike, I don’t know if I would use the word glamour, but I know what you mean. Tales of the Gold Monkey and Bring Em Back Alive were both inspired by the success of Raiders of the Lost Ark. But Dynasty was popular and there were series such as Remington Steele debuting. Thanks for mentioning Tales From the Hollywood Hills. PBS went through a short unsuccessful period trying to create American made scripted TV. Most were embarrassingly bad. I need to find and watch Tales From the Hollywood Hills again. I was a huge David Soul fan…when I was fourteen. I cringe at the thought of him playing Rick, but the idea of Ray Liotta as a barman in wartime North Africa is intriguing. David Soul was better than I expected, but he was still a limited actor trying to recreate one of the greatest iconic roles in film history. Seriously, I can not name one actor from that period that could have succeed in the role. Ray Liotta was a very young actor at the time. There were some signs of his talent but it was still very much in development. 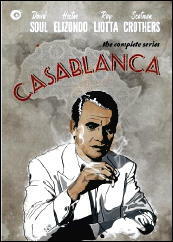 Ralph Senensky’s site does now include his memories of directing his two episodes of the “Casablanca” TV series.